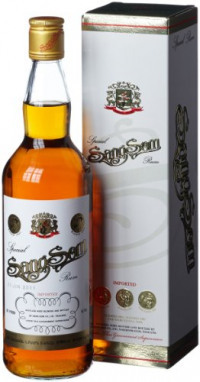 Sang Som rum is produced from the finest molasses and then aged in oak casks before being blended to produce this drink. Itwas first introduced into the Thailand market in 1977. Now, 30 years on it is the most successful beverage in the history of Thailand's liquor industry. Sang Som was created by Chula Kanchanakaksha who is widely acknowledged as the "liquor genius" of Thailand for his unique ability to balance both the art and science of spirit blending. Continuous improvement has been made to Sang Som via an ageing process of at least three years, resulting in a distinctly mellow flavour and aromatic nose. The complex taste and fragrance of Sang Som result in a unique partnership with soft drinks and fresh juices, making it the classic ingredient to any cocktail or blended beverage. In fact, it is a great favourite in the Khaosan Road area of Bangkok where tourists combine Sang Som and a mixer in a small bucket with ice, complete with a straw for each drinker - a lovely way to share the taste of Sang Som! 1982 and 1983 saw Sang Som consecutively awarded with Gold Awards for taste in both Madrid and Dusseldorf. With these gold medals proudly displayed on each Sang Som label, the brand is now widely known among Thai consumers as "Sang Som Rianthong", meaning Sang Som Gold Medals.